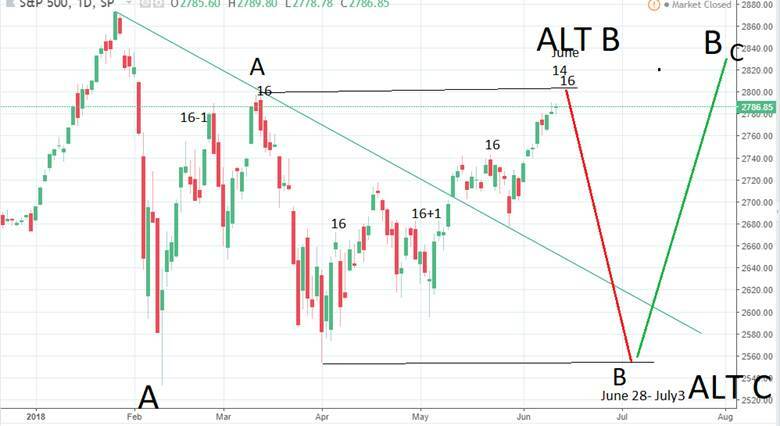 Stock Market Near Another Top? According to the Gann astro/cycles and my wave counts, we are near another important top. Ideally, this top should occur on June 14/15. The next possible cycle low is due sometime between June 28/29 and July 3/5 depending on the count and final top. 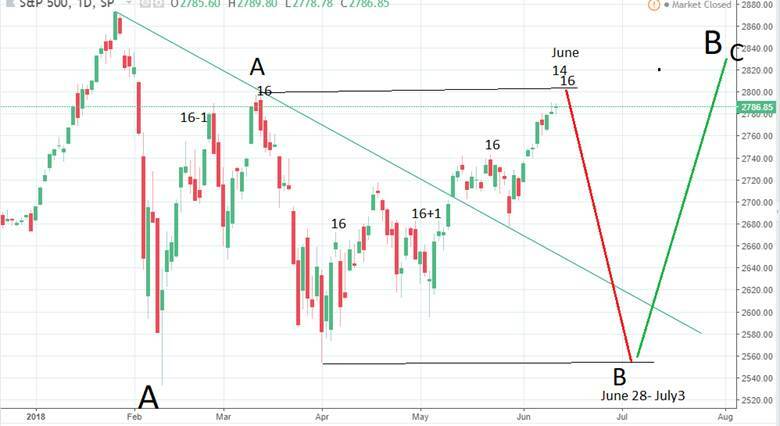 My preferred count has the S&P 500 moving down into July 3/5 to a slightly higher high than the 2553 mark tagged on April 2. The alternate has a much lower drop going down into the 2460’s by June 28/29. The ideal top this week is a minimum 2805 SPX. When the market fell in February, it readjusted the normally dominant 20 week cycle, which is now due toward the end of June or early July. The Gann 64/128 TD lows remain the same, due in early July. At any rate, we should see a nice summer rally out of the expected drop. Major cycles are due to top on August 19th one month and fall into mid November and even January-February 2019. Those have who been hoping for a mining share/precious metals rally may have to wait until early July. Even so, any rally attempt is likely to be met with selling (after a summer rally) into late this year and into early the next. The whole E-Wave structure looks corrective, even from early 2016, which marked the 7 to 8-year lows. 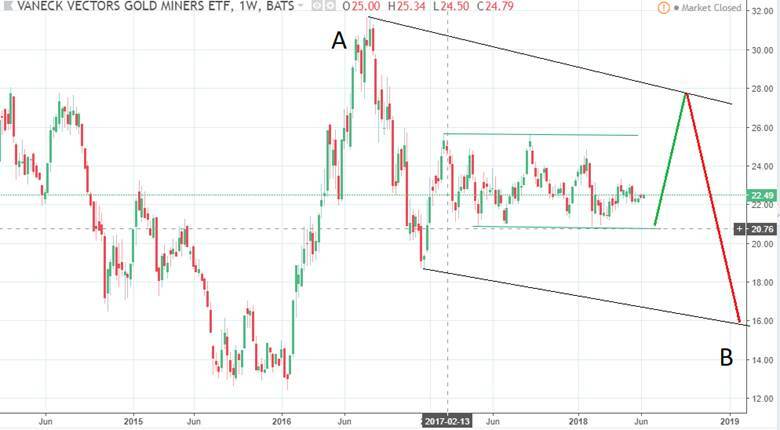 After the expected Primary Wave 4 sell-off that I expect late this year into early the next in the stock market (my target S&P 500 2183), I expect the precious metals and mining shares will muster another raging rally like what we saw in 2016 called ‘C’, but it should complete a larger Wave “B” (from the 2011 “31-Year” top), which means down hard into 2022/23 along with the stock market! My best guess is we see a flight of capital toward safety, back into the USA, and into US bonds and the dollar during the expected coming bear market crisis from 2020-2022/23. Already, we are seeing early signs of a major top forming in the stock market. I am reading data like we have previously seen in the year 2000 and 2005. The year 2000 was the last time we saw this low of an unemployment rate (3.8%) and 2005 was the last time businesses were as positive as they are now. I believe we see a 20%+ bear market dead ahead, but then a rebound into 2020: a last hurrah so to speak called Wave 5. Benner’s Cycle suggests a top in 2018 and a low in 2020 like we saw from 2000-2002, but the wave counts and the gold cycles don’t line up for that kind of scenario. Benner’s Cycle can be as much as 2 years off and I think that to be the case here. Another cycle I see dead ahead is a major war cycle for America. These repeating cycles go back to 1776, 1861 and 1941 and run about 80-85 years apart. The 20-22 year part of this cycle is due from early 2023 to around 2025/26 latest. Enjoy the good times while they last, because I believe things are going to change dramatically in the not too distant future. America, I fear, is once again a sleeping giant. Copyright 2018, BluStar Market Timer. All rights reserved. Disclaimer: The above information is not intended as investment advice. Market timers can and do make mistakes. The above analysis is believed to be reliable, but we cannot be responsible for losses should they occur as a result of using this information. This article is intended for educational purposes only. Past performance is never a guarantee of future performance.